If you are concerned about the following diseases: Bone Disease Acid, Base, Water Balance Cancer Diabetes Endocrine Disorders Heart Disease Iron Deficiency, Excess Kidney Disease Liver Disease, the CMP is one of the best test to help your doctor identify your health risks. The CMP is only $14.00, the lowest cost in the United States to access online on demand, and final results are available in just 24 hours or less after your blood draw. Depending on the results, your doctor will be able to dive deeper on specifics. And depending on the reference range (below normal, or above normal range) he/she will order additional testing. 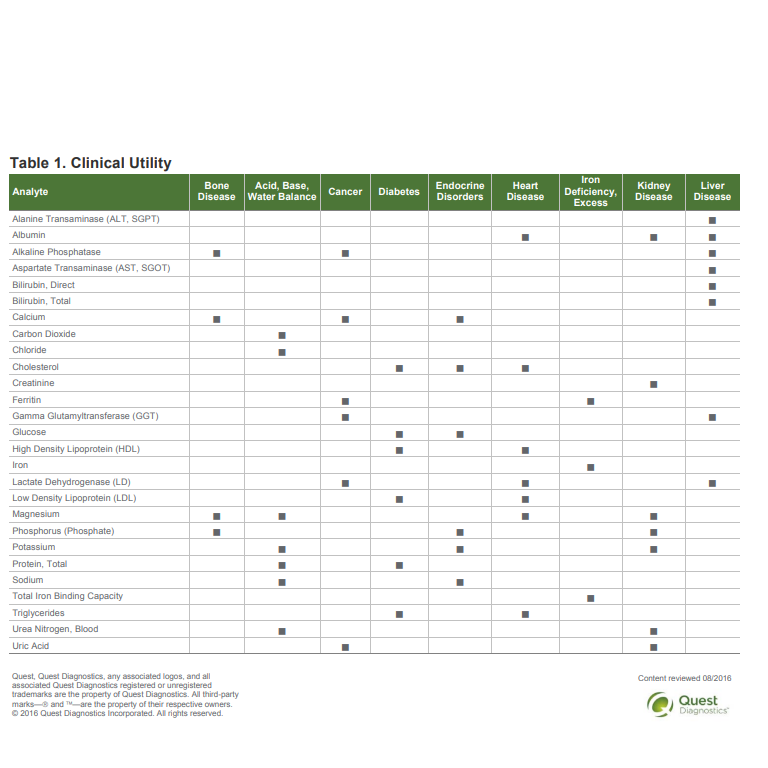 Please see our Clinical Utility Guide below at the bottom of the page. It gives an indication of an individual’s metabolism, kidney and liver health, electrolyte and acid/base balance, and levels of blood glucose and blood proteins. It is possible that you have an elevated test value that needs to be addressed, and you are not aware of it, some of which are considered critical values. For example, if your potassium is abnormal, you may need to go to the ER. There could be less critical values at abnormal levels which need attention if left untreated, such as higher than normal glucose levels. Roughly 10 percent of the U.S. population has diabetes. This condition can result in blindness, heart disease, stroke, kidney damage, and nerve damage if left untreated. With a simple blood test standing between you and these potentially serious medical complications, there’s no reason not to get your blood tested. If you drink alcohol you may want to check your kidney and liver function and the CMP test is a good indicator test for this purpose. The CMP also includes a calcium test which ensures that there’s enough of the mineral for proper functioning muscles, nerves, and the heart. Calcium is required to form bones and clot blood. Furthermore, the panels look for certain proteins and electrolytes as well as kidney and liver functions to ensure there proper functioning and little damage. Whether you’re reading this with specific symptoms in mind or you just want to be smart about your health and wellness moving forward, it’s never a bad idea to get tested. If you’re cautious, these statistics may change your mind. Medical decisions are made up by about 70% of blood test data. 90M Americans are pre diabetic and don’t even know it. Blood cancers account for almost 10 percent of new cancer cases each year in the United States. Approximately 1.5 million heart attacks and strokes occur every year in the United States. More than 800,000 people in the United States die from cardiovascular disease each year—that's 1 in every 3 deaths, and about 160,000 of them occur in people under age 65. Cirrhosis and other chronic liver diseases are common disease-related causes of death in the U.S. Blood tests like the CBC and the CMP panel will detect health risks generally with and without any symptoms. Don’t pass on this type of care just because you don’t think that you need to. Remember, you’re in charge of your health and it’s vital that you don’t pass on the opportunities that allow you to take additional ownership. If this blog post has your mind turning, keep reading! Learning more is one of the best ways to better your health. If you want to read more about the variety of blood tests offered and their basic uses, check out this blog, Top Ten Blood Tests. If you’re ready to take action, come see us! 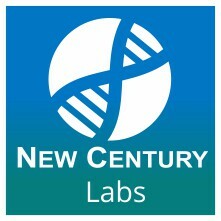 Visiting New Century Labs online is the best way to get your tests done, even if it’s precautionary. We offer low cost and convenient blood tests in the United States. Take back your health and maintain your body with easy access to the tests you need. With over 2,300 patient service centers throughout the United States and no appointments necessary, health and wellness start today. Don’t wait! Order a test here. Copyright © 2019 WWW.NewCenturyLabs.com All rights reserved.